Over and again, the market has shown us that the longer you stay invested in equities, the better chance you have of seeing higher returns. However, most investors cannot afford to leave their equity investments in the market forever. Given these realities, we built growth portfolios that use proprietary mathematical algorithms to calculate and improve a client’s probability of reaching a time-based goal. The chart uses data from several providers to create a historical audit of returns. Historical audits are a method for back-testing performance with the benefit of hindsight. Back-tested performance is provided for informational purposes only and does not represent actual performance. It is strictly hypothetical – this is what would have happened in the past, not what will happen in the future. Actual performance may have been materially lower had investors made withdrew money from or deposited money to the portfolio or if external random factors had been different (e.g. if the Great Depression had been avoided, or if World War II not occurred, or if Kennedy had not been assassinated, etc.). No matter how positive historical audits have been over any time period, the potential for loss is always present due to factors which may not be accounted for in the historical audit. The nature of a back-tested audit creates the potential for a financial professional to select superior performance results in order to get the desired audit results. The dataset range is 1927 to 2015. The primary sources are: Center for Research in Securities Prices (CRSP), Fama/French Research Database, Dimensional Fund Advisors, MSCI, Ibbotson Associates and Global Financial Data. Some datasets have been extended using multiple regression analysis. Since selling equities in a down market may reduce an investor’s probability of reaching their goals, we seek to maximize the minimum returns of the equity portfolio during the time horizon when a client may sell equities. We built our growth portfolios around specific time horizons (1-3 years, 4-6 years, 7-15 years, and 15+ years) so that you can align a client’s time-based goal with a portfolio that seeks to improve their probability of reaching that goal. 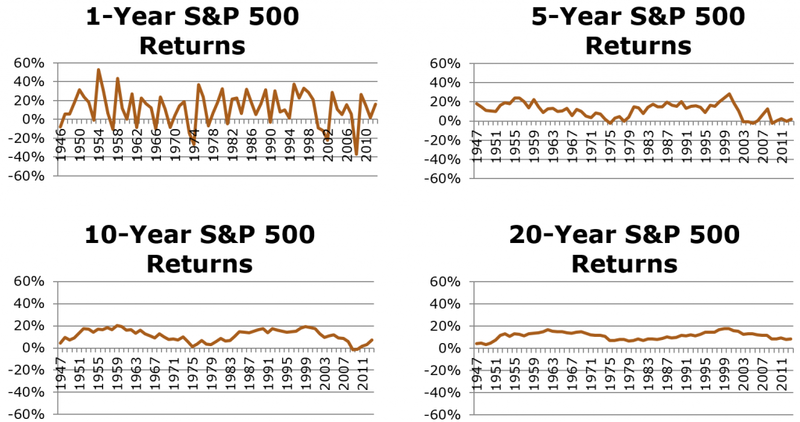 Since we create the portfolio mix for each of our time-targeted portfolios by seeking to optimize the historical minimum returns over each time-aligned rolling period going back to 1927, we can create predictability through the uncertainty. 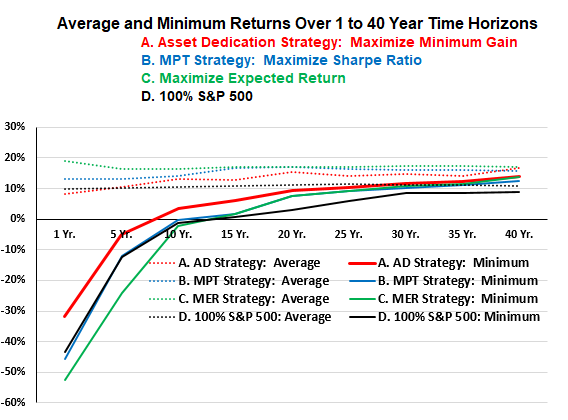 How do the minimum, and average returns of different asset classes compare when invested for 1-year, 2-years, 40-years, or anything in-between? To answer these questions, we looked at the average and minimum returns of various asset classes during every rolling period (1-year spans to 40-year spans) between 1927 and 2013. Once we finished collecting the data, we compared the asset classes over each rolling time horizon and began to see which asset classes might make sense for the different time spans. As we learned from MPT, diversification can help balance the risk and reward profile of a portfolio. Given this, we were left asking ourselves what asset class combinations are optimal for investors withdrawing from their growth portfolio in 5 years, 6 years, 7 years, etc. To answer these questions, we looked for a mathematical principle that would provide a decision-making strategy for selecting an asset class mix for each withdrawal horizon. 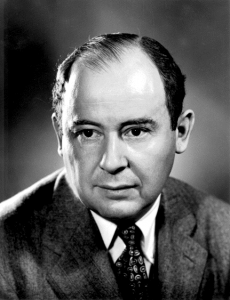 During our testing, we found that John von Neumann’s minimax principle selected combinations of asset classes that out-performed the minimum and average returns of the S&P 500 among other indices* during the targeted time-horizon. This breakthrough, made us realize that if an investor uses a minimax portfolio that aligns with their investable time horizon, they may reduce sequence risk and drawdown risk while participating in the upside in the equity market. Using these insights, we used the minimax principle to create time targeted portfolios for each 1-40 year time horizons using rolling time horizon return data going back to 1927. Now we had 40 different portfolios (1 year, 2 years, …..,40 years), we were left asking ourselves whether we should offer 40 time-targeted portfolios or find statistically significant groupings of time-horizons. 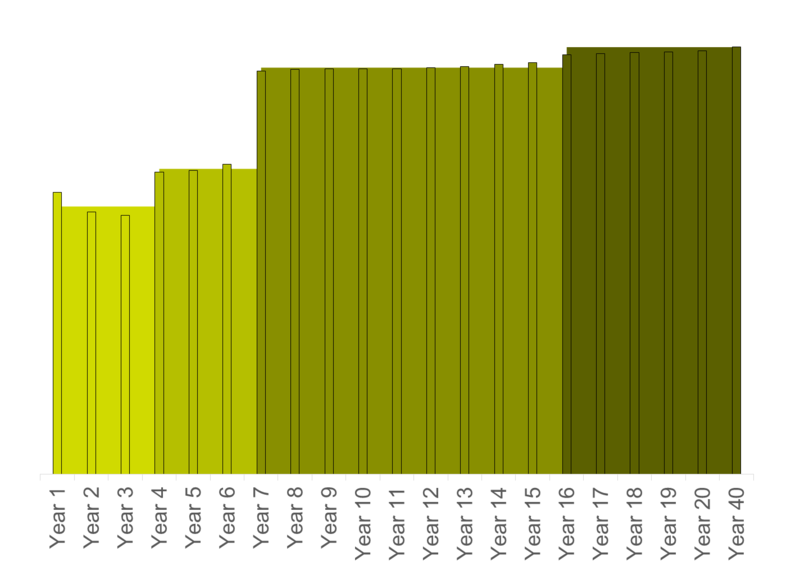 After applying a statistical technique called cluster analysis to the data set, it became evident that we should group the time targeted portfolios into 1-3 years, 4-6 years, 7-15 years and 15+ years time horizons. After solidifying the asset class combinations for the different time-targeted growth portfolios, we had to find investments that would allow us to deliver the desired asset class exposures. Since Dimensional Funds has one of the strongest data sets in the industry, low expense ratios and a reputable track record, we selected their funds for the majority of the investments. That said, we will utilize no transaction fee ETFs instead of Dimensional funds when an investment is below a certain threshold. In this video, Professor Huxley and Steven Huxley meet with the American College to dig into the research behind the time targeted portfolios and how we implement them. Enjoy! Fill out the form below, and you will be directed to our online meeting scheduler.